Hi Clear Scraps fam! Leah here with you today sharing these super cute chipboard embellishments that I used to make two cards. This one features the Girl Cloud cutout. I cut down the 12x12 Acrylic and turned them into 4x6" cards. Using these chipboard cutouts on acrylic allows you to create 3d looks by allowing stuff to show through from the back to the front. Notice the star behind the G? Once I placed the star behind the front panel, I then assembled the girl cloud to the front. So fun! The baby pin chipboard embellishments I decided to paint pink as well since I used it on the birthday girl card. Hey, Clear Scraps friends. Leah here with you today sharing these adorable miniature tags using the Creating Made Easy Jan Q 2019 kit. From the kit, I used the modellier creme, Clear Scraps 6" raindrop heart mascil, Graphic 45 paper and Studio light paper. I started by applying the modellier creme to the Studio light paper and set it aside to dry. Inside the graphic 45 paper pad is a tag template, cut that out. Once your stenciled paper dries, turn it over, and position your tag template on there and trace out the template. Cut just inside the traced lines, fold in half and decorate. Using the same template and different pattern paper, you can create different size tags. For this one, we'll create a tag holder and insert. Fold your paper in half, and align your template on the fold. Cut against part of the template, slide the template to the left, and finish cutting against the template. Glue the bottom and open side edge, leaving the top open to insert a tag. Trace half the template on another sheet of paper and cut out for your tag insert. Using the technique as above, here's another tag. So easy and fun to give handwritten thank you notes. HI everyone, Steph Ackerman here with a set of cards using the Heart stencil, Viva Décor Modeling Cream, Graphic 45 Flutter paper pack and Want2Scrap bling from the January kit. This stencil is perfect for Valentine's Day, Anniversary and Love creations. Placing the stencil on cardstock, I used a pallet knife to spread the modeling cream. Look at the beautiful effect on both pink and red cardstock. I created cards from black cardstock and matted each stenciled panel with black cardstock so the panel would pop. Using papers from the Graphic 45 Flutter collection, I assembled the red card, placing ribbon between the layers. To finish I added Want2Scrap pearls around one of the hearts. A small sentiment was then added to the left side. The pink card was assembled without ribbon. Again, I placed Want2Scrap pearls around one of the hearts. As I wanted to create an anniversary card, I added an anniversary phrase and placed several pearls under the phrase. There you have 2 different cards with one stencil. Hello and happy Wednesday! Jennifer here to share Christmas cards I created along with some fun techniques! 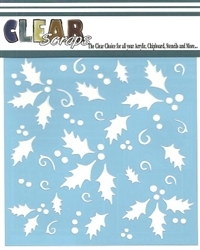 I love working with Clear Scraps Acrylic because not only does it have many uses, but its durable too. Using the 12x12 Acrylic Sheets, I cut 4x5 inch sections to use on my cards. My third "card" is actually from the Acrylic Tag Album. Any time you want to stamp on acrylic you will need to use a solvent based ink. This will allow your image to "set" to the acrylic and will not smudge. After removing the protective film from both sides of the acrylic, I stamped my image using StazOn in black. Allow a short time for the ink to dry before moving on to the next step. When you are ready to color your image, flip over the acrylic piece. Here, I used alcohol based markers (such as Chameleon or Copic). I like to have a fine and brush option on my markers so I can fill in larger areas quicker. Or, as around my title, use color to highlight an area. Once finished, I added patterned paper and embellishments to accent! For my second card, I used basically the same technique as the first. However, I originally had a second flamingo stamped on the front. It didn't turn out so I decided to "erase" my image by using non-acetone fingernail polish remover. It works wonders on your mistakes! I wanted to add a frosty effect to my card so using StazOn Opaque, I ran the ink pad around the edges of my acrylic. After stamping and coloring my flamingo, I used the 6 Inch Nordic Snowflakes Mascil to add a background to my card. Again using the StazOn Opaque, I lightly dabbed with an ink applicator. And here is a close up of the effect! Once dry, I adhered my acrylic to the cardstock base and added patterned paper and embellishments! For my third project, I decorated one of the tags from the Acrylic Tag Album. I began with three coordinating alcohol inks and applied them from dark to light beginning at the bottom of my tag. I turned my tag over after my alcohol ink was dry and stamped my images. Using my Zig markers I went back in and colored my flamingo..however the alcohol ink did alter the color a bit. I backed my tags with a neutral print using Beacon 3-in-1 adhesive along the edges. Using strips of a buffalo plaid print, I affixed them to the sides of my tag to hide any glue marks. Thank for stopping by the blog today! I hope this inspires you to do some crafting with Clear Scraps Acrylic! Have a great day! Additional products used: patterned paper: Crate Paper, Simple Stories; stickers, die cut: Simple Stories; adhesive: Beacon, 3M; bakers twine: Whisker Graphics; metal token, alcohol ink: Ranger; stamps: My Favorite Things; ink: StazOn; markers: Zig, Chameleon; border punch: EK Success; cardstock: Bazzill; mini wood clothespin: American Crafts; sewing machine: Janome; misc: thread, ribbon. Hello, friends! It's Nancy Nickel here with you today! because for me it displays the true meaning of Christmas. It's all about celebrating the birth of Jesus! I then adhered it to a black card base. I couldn't make the star black...that wouldn't make sense! So I embossed it in this pretty Enchanted Gold embossing powder. Now it looks like a "Star of Wonder"! I wish you all a Christmas Full of Joy and Blessings! Hi everyone! Laura here to share some inspiration with you today! are you ready for some Christmas crafting? Who needs a GREAT card/gift idea? How about both in one? of an old favorite, the easel card. Clear Scraps Mini Shaker X-Mas Tree. First up is to paint the top layer with acrylic paint. then added in some fun beads and sprinkles. some stickers, a twine hanger and bow on the top. the ornament on their tree. a friend or family member for the holiday! sure to stop by the Clear Scraps store to check it out! rhinestones, Stickles, acrylic paint, Beacon Adhesive. It's Nancy Nickel back with you today, sharing another Christmas card. 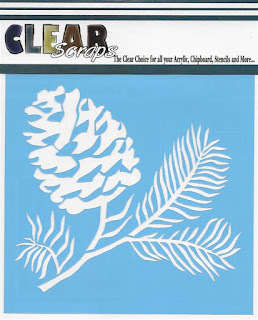 This time I'm featuring the 6" Pine Cone stencil. This is another nice flat card that can easily be popped in the mail. My card measures 5 1/2" square. I inked the stenciled image with Distress Oxide Inks. Then I spritzed it all with water. I love how that brings the ink to life! Once it was all dry, I mounted it on to the card base. I stamped the sentiment in the corner. To add the Stickles, I held the card up vertically. I then added it to the top spots, and let it drip, like melting snow would. It's Nancy Nickel here today with a new project idea! Today I'm sharing a Christmas card featuring the 6" Holly Stencil. We all need cards that are flat, and can easily be popped in the mail. This design is really good for that. I've made it 5 1/2" square but it could easily be done in A2 size. I thought the addition of the purple really added some fun excitement! When I was finished I trimmed it to 5 1/4" and misted it with water. I love what the water does to the Distress Oxide inks on kraft! I mounted the finished piece onto a 5 1/2" purple card base. I stamped the sentiment on kraft, using the Memento Tuxedo Black ink. I matted it with purple cardstock, and adhered it in place with foam tape. Finally, I added a pretty purple double-looped bow! Hi everyone, Steph Ackerman here with a set of Fall Cards. Have you checked out the Clearly Accent Embellishments? There are a lot to choose from and the project possibilities are endless. I'm using the Leaves Embellishments - a set of 4 different sized leaves - on my cards today. Using papers I had left over from the October kit club, I created two cards and the leaves embellishments were perfect accents. Using several colors of StazOn Studio Glaze, I outlined the leaves. I let them dry before continuing. Next, I filled in the leaves with other colors and mixed the colors together with my fingers. The leaves look amazing. Once dry, I placed the leaves on the cards. Hi everyone! Laura sharing with you today! decor piece (with a twist I'll share later in this post). This project starts with the Clear Scraps Blank Wood Card. They are sturdy little pieces of crafting heaven! the only limit is your own imagination and creativity! 6" Damask Stencil to use to create a pretty border on this card. on just the edge of the card. Then I added some enamel dots to highlight the stenciling. some fall stickers and more enamel dots. I used an extra 5x7 frame I had laying around, and added a 5"x7"
different cards depending on the seasons! piece for each season. I'm so excited to get started on one for Christmas! Stop back soon for more inspiration and ideas! Other: Beacon Adhesive, brown ink, Carta Bella-Fall Break, enamel dots. It's Nancy Nickel here with another project share for Clear Scraps! This is my second project share using the fabulous October Q Kit. This time I'm sharing my Angel Pallet Ornament Card. This project is a Christmas Card and Gift all in one. I began by using the gorgeous Creative Impressions Gilding Polish from the Kit, to paint my wood Angel Pallet. I set this aside to dry, and went on to prepare my card. I cut a 5 1/2" square card base, using cardstock from my stash. and adhered it to the front of the card base. I cut a 5 1/4" square of striped paper from the Authentique Holiday Collection, included in the Kit. I adhered this in place, on top of the green cardstock. I positioned the dry Angel in place on the front of the card. as well as on each side of the wood support lower down. and left some longer tails. and trimmed the tails short. I cut this sweet tag from another one of the Authentique Holiday Collection Papers, included in the Kit. before adhering it in place to the inside of the card. to simply remove this Angel ornament from the card. and the Angel is ready to hang on the tree! or a name and year can be written/stamped on the front! Papers: Cardstock - White, Green; Metallic Cord - Green, Gold; Tool: Paper Piercer. Hi everyone, Steph Ackerman here to share some of the fun products that are found in the Clear Scraps October kit. The kit included a Wood Pumpkin Shaker Album, Wood Mini Angel Pallet Shape, Wood 5 piece Small Banner, Carta Bella Fall Break pattern paper and sticker set, Authentique 6" x 6" paper pad and Gold Treasure Gilding Polish. I created cards from brown cardstock. Using Clear Scraps Wood Grain Stencil, (not included in kit) I placed it atop cardstock panels. Using Gold Treasure Gilding Polish, I created the backgrounds for my cards. The included sponge applicator made it easy to paint the stencils creating amazing backgrounds. And with minimal drying time too! Once the panels dried, I adhered them to my cards. Using the Fall Break sticker sheet, I matted the leaf strip with cardstock then added it across the card. A large oval was die cut and the truck sticker was added. Finally Autumn was added to cardstock then fussy cut before adding it above the truck. A checkered panel was matted with cardstock and added across the card. The sticker panel was added to a larger die cut panel and added to the card with foam adhesives for dimension.